Select Books (NY), 9781590793671, 352pp. 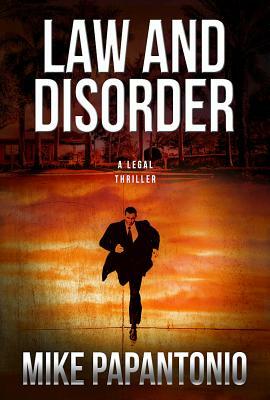 In the tradition of John Grisham, from radio talk show host and "America's lawyer" Mike Papantonio, comes Law and Disorder, a highly suspenseful legal thriller in which a Florida attorney finds the system working against him. Brash, brilliant, handsome Nicholas Deketomis has built a highly successful career as a lawyer protecting the rights of the innocent while winning multibillion dollar lawsuits from the powers that be. "Deke" may have come from the wrong side of the tracks but he's built a wonderful life for his close-knit family. His wife, Terry, and two children live in a beautiful house in a seaside community along the Florida Panhandle. But their comfortable life is endangered. In the midst of a highly contentious multimillion dollar lawsuit against a powerful pharmaceutical company, as well as publicly advocating for a liberal Florida State Senate candidate, this time Deke may have riled the wrong powerbrokers. Scheming against him are a local Bible-thumping preacher, an ambitious district attorney, and two malicious brothers running one of the country's biggest oil corporations. A vile conspiracy is hatched to bring down Deketomis: Setting him up and attempting to convict him on a bogus murder charge would solve many of their problems. Deke's in the trial of his life, which quickly becomes a media circus. But this good man will not go down without a bruising fight--especially when he finds his family threatened. And just as it seems that his enemies may have him cornered, he finds help from the unlikeliest source. Mike Papantonio is a senior partner of Levin Papantonio, one of the largest plaintiffs law firms in America, that has handled thousands of cases throughout the nation involving pharmaceutical drug litigation, Florida tobacco litigation, litigation for asbestos-related health damage, securities fraud actions, and other mass tort cases. "Pap" has received dozens of multimillion dollar verdicts on behalf of victims of corporate corruption. Mr. Papantonio is one of the youngest attorneys to have been inducted into the Trial Lawyer Hall of Fame. In 2012 Mr. Papantonio became President of the National Trial Lawyers Association, one of the largest trial lawyer organizations in America. For his trial work on behalf of consumers Papantonio has received some of the most prestigious awards reserved by the Public Justice Foundation, The American Association for Justice, and the National Trial Lawyers Association. Mr. Papantonio is an author of four motivational books for lawyers. He is also co-author of "Air America: The Playbook" a "New York Times" Political Best Seller. Mr. Papantonio is the host of the nationally syndicated radio show Ring of Fire along with Robert F. Kennedy, Jr., and Sam Seder. In addition to the radio program, Mr. Papantonio also hosts Ring of Fire when it airs on the Free Speech TV network. Mr. Papantonio has conducted hundreds of recorded interviews with guests, including Dan Rather, Helen Thomas, Howard Zinn, Arianna Huffington, Mary Chapin Carpenter, Bernie Sanders, David Crosby, Merle Haggard, Morgan Spurlock, John Edwards, Bill Moyers, Rickie Lee Jones, Alanis Morissette, Pete Seeger, Jackson Browne, Chuck D from Public Enemy, Henry Rollins, Ted Sorensen, and Elizabeth Kucinich. His role on Ring of Fire is featured in the movie, Jesus Camp, which was nominated for the 2007 Academy Award for Documentary Feature. Mr. Papantonio is also a political commentator who frequently appears on MSNBC, Free Speech TV, RT America Network, and Fox News.